Heading into Week 7, as we do each week in this space, we’ll be looking at some of my top DFS tournament plays of the week. We’ll be naming one player at each position and on each site for the main slate. Note: Just because a player is mentioned under one site doesn’t mean they aren’t also a good value on another site. If we only count games Beathard has started and finished, he’s basically produced as a mid-range QB1 for fantasy. 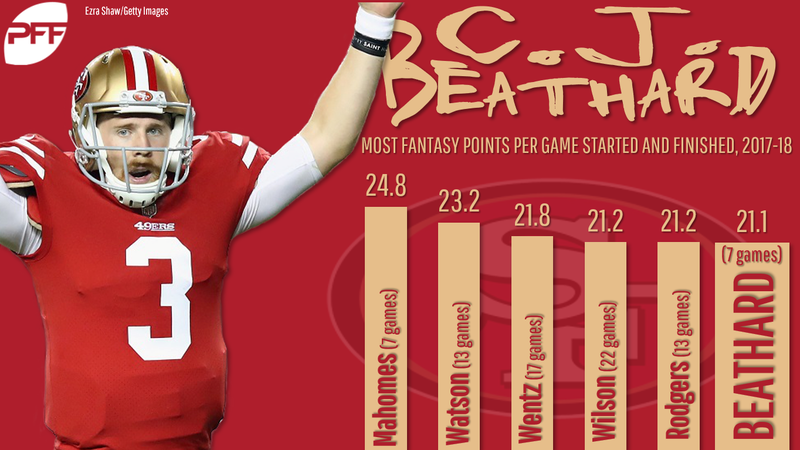 Over the past two seasons, Beathard would rank sixth among all quarterbacks in fantasy points per game (21.1). That’s better than Tom Brady, Drew Brees, and Ben Roethlisberger and only one-tenth of a point behind Russell Wilson and Aaron Rodgers. He’ll have volume on his side as 9.5-point favorites against the Rams, and the matchup isn’t the least bit intimidating with Aqib Talib out and Marcus Peters banged up. San Francisco scored at least 30 points in both games against Los Angeles last year, and the Rams are surrendering 27.3 per game since losing Talib. If looking to stack Beathard with one of his receivers, I like Marquise Goodwin – the Rams are giving up the second-most fantasy points per game to wide receivers on deep passes. Volume and efficiency should be good again this week against a New England defense that has given up the second-most receiving fantasy points per game to opposing running backs since Week 1 of last year. Last week, Gordon’s snap share jumped from 26% to 80% and he saw a team-high nine targets. On Tuesday, head coach Bill Belichick said of Gordon, “I would just say his role is expanding weekly and we’ll just see how it all plays out.” This week he gets ready to face a Chicago defense giving up the third-most fantasy points per game to opposing outside wide receivers (New England’s other outside wide receiver, Chris Hogan, ranks third-worst of over 100 qualifying wide receivers in targets per route run). Mayfield has played much better than his box score indicates, grading out ninth-best of 36 quarterbacks and posting an adjusted passer rating of 95.1 (13th-best). Now, he has the benefit of facing a borderline-historically bad Tampa Bay pass defense in the second-highest over/under of the slate. If the season ended today, the Buccaneers would rank worst among all pass defenses this past decade in opposing passer rating (129.5), passing yards allowed per game (366.8), passing touchdowns allowed per game (3.2), and interceptions percentage (0.5%). If looking for a stacking candidate (outside of Njoku), I also like Jarvis Landry. He runs 73% of his routes from the slot, while Tampa Bay is giving up 28.1 fantasy points per game to slot wide receivers. With Carlos Hyde now in Jacksonville, Chubb would easily be the best value of the slate if he assumes the entirety of Hyde’s missing workload (granted, not a given). Hyde ranks 12th among running backs in expected fantasy points per game, averaging 19.0 carries, 1.5 targets, and 1.7 opportunities inside the 5-yard line per game. Tampa Bay’s defense has given up the third-most receiving and the 14th-most rushing fantasy points per game to opposing running backs. The Buccaneers are allowing opposing rushers to average only 3.47 yards per carry, which ranks fourth-best. That seems to make the matchup tilt more toward Duke Johnson’s favor, but with DT Gerald McCoy and DE Vinny Curry out for Week 7, I’m not so sure. Last season Curry was our 13th-highest-graded edge defender against the run (of 103 qualifying). This season, McCoy is our 12th-highest-graded interior defender against the run (of 118 qualifying). Thielen leads all wide receivers in fantasy points per game and expected fantasy points per game. He’s on pace to break the single-season target record and single-season reception record, and rank second all-time in receiving yards and (at the position) fantasy points. The Jets are giving up 24.0 fantasy points per game to opposing slot wide receivers (second-most) but the seventh-fewest to outside wide receivers. With Buster Skrine (the Jets’ starting slot cornerback) out again, Thielen should run 61% of his routes against Parry Nickerson, a sixth-round rookie who is four inches shorter and 20 pounds lighter than Thielen. Since Skrine went down in the first quarter of Week 5, Nickerson has given up 15 receptions, 169 yards, and two touchdowns (on 19 targets). Jack Doyle is doubtful to play this week and hasn’t played since Week 2. In the interim, Ebron ranks behind only Zach Ertz and 13th among all receivers in fantasy points. In terms of usage, he ranks much higher. In this span he ranks behind only four players in expected fantasy points (Todd Gurley, Thielen, DeAndre Hopkins, Davante Adams). He ranks first in end-zone targets (eight), fifth in targets (43, second among tight ends), and 10th in air yards (first among tight ends). In spite of all of this, he’s priced outside of the top-two tight ends and outside of the top-15 receivers on both sites.